Industrial Hardfacing, Inc. offers new manufacture or complete rebuild of worn twin screws, thus restoring performance requirements. From minor flight repair to complete flight replacement, including stainless steel cladding, drive shaft/bearing journal repair, and house screen replacement. Many options are available to meet your requirements. IHI specializes in Twin Screw Press Shaft flight repair. We are able to inspect each shaft and determine the amount of Hardfacing required to rebuild and resurface each flight. We also are able to remove worn cladding areas and patch and repair stainless steel cladding. Industrial Hardfacing specializes in Twin Screw Press Shaft Flight Replacement. In the most extreme cases the entire flights can be removed and replace to improved original factory specs. complete Stainless steel recladding and Flight replacement services. IHI has the ability to remove all or portions of the Twin Screw Press Shafts stainless steel cladding. 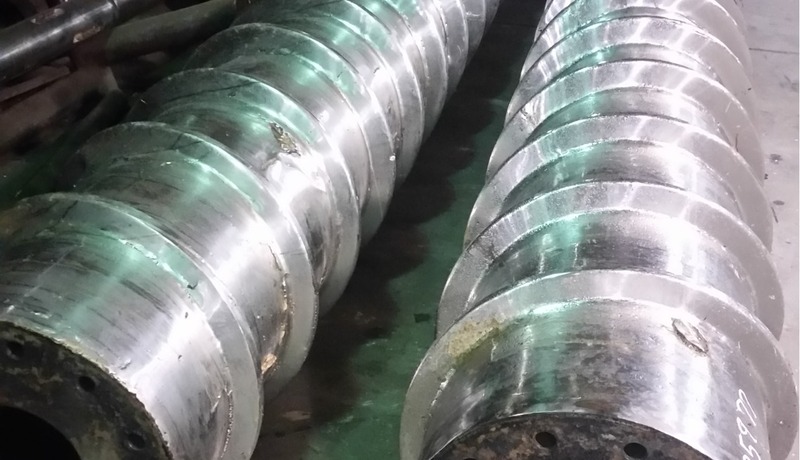 Our machinists and welders restore each Twin Screw Press Shaft to original factory specs savings extensive amounts over purchasing new replacement shafts. IHI can replace driveshaft bearings and repair journals for Twin Screw Press Shafts. IHI can replace the House Screen for Twin Screw Press Shafts.